Whether your drivers are driving locally or long distance, a commercial truck insurance policy is a must. A Commercial trucking insurance policy is designed to help protect against loss to any number of hazards, including physical damage to the truck and other vehicles, liability to trailers both owned and non-owned and damage to cargo. 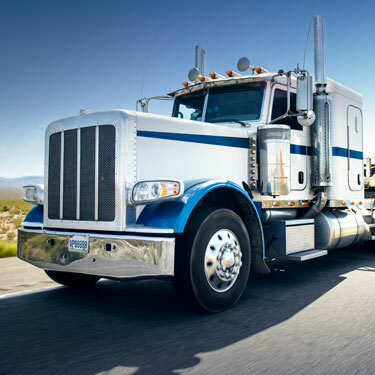 At EquiInsurance, LLC we have a department exclusively dedicated to trucking insurance. Our knowledgeable and dedicated staff can match your insurance requirements to an affordable policy tailored to meet your needs and assist you with any questions you may have. Primary Liability Insurance coverage protects you from damage or injuries to other people as a result of a truck accident. This coverage is mandated by state and federal agencies and proof of coverage is required to be sent to them. We provide coverage limits ranging from $35,000 to $1,000,000. Pricing is dependent on region, driving records, and history of the trucking operation. For a more detailed description of this coverage visit our information center. Non-Trucking Liability (Bobtail Coverage) provides limited liability insurance for owner-operators who are permanently leased to an ICC regulated carrier. It provides limited liability protection when the owner-operator is not on dispatch, nor pulling a loaded trailer. For example, this coverage would apply when the owner-operator gets their truck washed or brings their trucks into a shop for repairs. Once the owner-operator is under dispatch, they are covered under the Primary Liability insurance policy of the company that they are leased to.